This year marks the 20th anniversary of the Bethesda Row Arts Festival. Each October, this festival transforms Bethesda streets into an outdoor gallery lined with fine art of every medium. 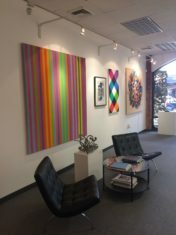 But Bethesda is a great place to shop for fine art any time of the year, with a number of studios and galleries throughout the city. View the full list of Bethesda Galleries and Studios below. While you’re in the neighborhood, tour Fox Hill and visit our fully-supplied art studio. Strathmore, housed in a historic mansion in Bethesda, hosts over two dozen premiere exhibits each year through collaborations with renowned museums and art institutions. Outside Waverly Street Gallery in Bethesda, MD. Photo from Waverly Street Facebook page. 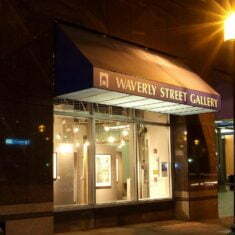 Monthly exhibitions at Waverly Street Gallery showcase original artwork work from painters, sculptors, printmakers and more. Artists at Studio B rent space available through the Bethesda Urban Partnership, who manages the Bethesda Arts & Entertainment District. Inside Gallery B in downtown Bethesda. Photo from bethesda.org. Gallery B, managed by the Bethesda Urban Partnership, is a non-profit art space available for monthly rentals. Have an original piece of art without a frame? Framer McGee’s Gallery in Bethesda has a wide selection of unique mats and frame supplies to complete any piece. Marin-Price Galleries features a wide range of contemporary art from American and European artists. 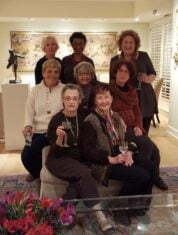 Artists at Upstairs Art Studios in Bethesda gather for a photo. Photo from Upstairs Art Studios Facebook page. Upstairs Art Studios is home to eight artists creating art in downtown Bethesda. Viewings are by appointment only. Outside Lenore Winters studio in Bethesda, MD. Photo from Lenore Winters Facebook page. 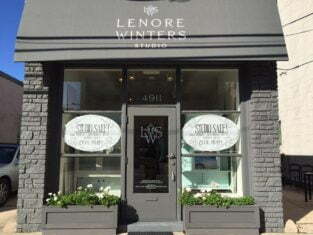 Lenore Winters Studio features a range of samples and unfinished furniture to showcase their craft in decorative painting services for both interiors and furniture. The studio is available by appointment only. 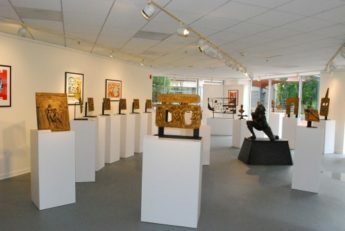 A look inside Bethesda Fine Art Gallery in Maryland. Photo from bethesdafineart.com. Bethesda Fine Art features a gallery of fine art of various mediums – especially 20th-century works.